We even added our first User Interface - for Xamarin.Android. Now let’s move forward to Xamarin.iOS. Same as we did with the Core project, we will use a standard template to create the iOS project. Add a new project to your solution - a ‘Blank App (iOS)’ application with name TipCalc.iOS. The Entitlements.plist, which contains certain configurations - we won’t touch it for now. The Info.plist file, which is the equivalent for an Android ApplicationManifest. Because we will add our own view. After you have deleted those, open the Info.plist file and under the ‘Deployment Info’ section, remove the text in the ‘Main Interface’ input (leave it blank). The AppDelegate class plays a very important role on iOS apps, as it provides a set of callback that the OS uses to inform you about events in your application’s lifecycle. In the code snippet above, we’re extending the app’s AppDelegate from MvxApplicationDelegate, and that class contains two generics: one for a setup class, and one for a core app class. In our case, we want to use the default Setup class MvvmCross provides for iOS applications. In your own app, you may want to use a custom one, which extends MvxIosSetup<App>, to add some customization. That’s it! MvvmCross is up and running after this small addition. Create a folder called Views. Within this, add a new ‘View Controller’ and call it TipView. Double click on the XIB file to edit it. Just as we did with Android, we won’t go into depth here about how to use the XIB iOS editor - instead we will just cover the bare basics. 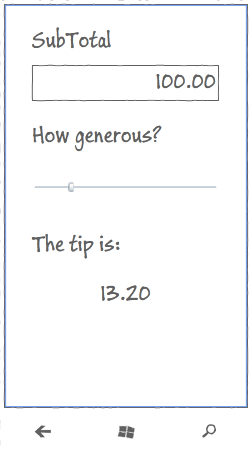 Set the Maximum Value of the Slider to ‘100’. Using drag and drop, you should be able to quite quickly generate a design similar what we accomplished on Android. Because we want our TipView to be not only a UIViewController but also an MVVM View, then change the inheritance of TipView so that it inherits from MvxViewController. The generic parameter to MvxViewController is used to link TipView to TipViewModel. What this code does is to generate ‘in code’ exactly the same type of data-binding information as we generated ‘in XML’ in Android. This binding syntax is called fluent. Note You need to add all the bindings after base.ViewDidLoad() runs, because that’s where MvvmCross locates the TipViewModel. Also note that after you specify all your bindings, you must call set.Apply() for them to be added. You may have noticed that data-binding in iOS looks very different to the way it looked in Android. This is because the XIB format used in iOS is a lot less human manipulable and extensible than the XML formats used in Android AXML and or Xamarin.Forms / Windows XAML - so it makes more sense to use C# rather than the XIB to register our bindings. Although this sample only shows simple bindings, the infrastructure built within MvvmCross is really powerful! Our data-binding engine supports ValueConverters, ValueCombiners, FallbackValues, different modes of bindings and a super straight forward mechanism to add your own custom bindings. At this point you should be able to run your application and see some magic. Let’s move on to Windows!